Gerlach (The King’s Mechanic, 2015, etc.) 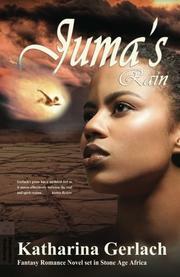 turns to Africa in a tale of humans and gods set in the Stone Age. Jumatoa “Juma” Botango wants nothing more than to win the role of chieftess in the matriarchal tribe her mother abandoned. Having reached training age, she travels with her father and two brothers to the central village to join her peers and learn from the elders. But claiming her mother’s birthright will not be easy. She immediately clashes with her cousin Kandra, the daughter of the current Chieftess Jakombe, who has led the tribe since Juma’s mother left. Juma hopes to prove her worth beyond doubt but is distracted from this goal at the welcoming ceremony, where she sees a mysterious man with bright red hair among the crowd. When the stranger causes a young man to collapse without warning, Juma realizes he must be Mubuntu, the Lord of Fire, making mischief while his sister Vanamate, the Keeper of the Water, sleeps. Juma manages to save the young man by using Vanamate’s magical tears, which she obtained while walking in the spirit realm. But the tribe’s trials are just beginning. Mubuntu has imprisoned Vanamate through his trickery, creating a massive drought. Soon Juma and her people must contend with the dual threats posed by other parched tribes in search of water and Mubuntu’s quest for power—for if he succeeds in keeping Vanamate asleep, the drought will mean an end to the girl’s tribe. Gerlach’s prose has a mythical feel as it moves effortlessly between the real and spirit realms. Especially enjoyable are the complexity of the matriarchal society and the intricacies of the world of the gods. Juma, a competent and complicated protagonist, has confidence in her abilities without dismissing the wisdom of her peers and elders, and the romance Gerlach crafts reflects the care and consideration with which Juma approaches all aspects of her life. Though there are moments of awkwardly modern phrasing (“Kandra had a breakdown” and “[He] jumped Chunte”), these rarely detract from an engaging plot. An enjoyable fantasy with a complex heroine set in an unusual time period.